Like many from the Advertising and Marketing Industry and I think a few other common folk I am eagerly awaiting the season premier of Madmen on Sunday August 16. 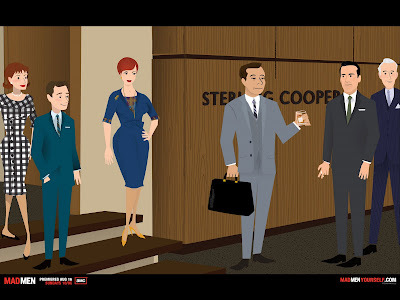 To help with the hype of the season premiere Madmen has launched a new feature on the site (hosted by AMC) that allows you to be a part of the show by creating your own character ('Madmen Yourself'). Much better than my character on World of Warcraft named Don Draper, my Peggy character on Habbo Hotel and my account under the name Pete Campbell I have on Plenty of Fish. Seriously though this is a great little application to have some fun with if you are 'Mad' over Madmen (see what I did there). I suggest taking a run at it if you have a little time to kill. And if you really have what it takes Madmen has teamed up with Banana Republic for a 'Madmen Casting Call' to showcase Banana's new line of clothing.